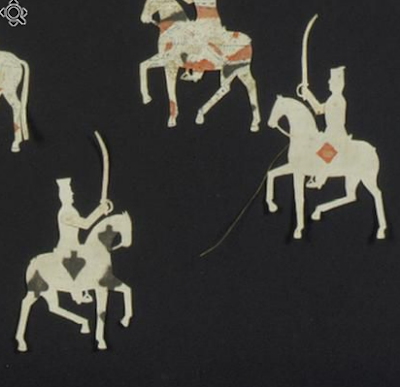 Using an oil lamp and a bulls eye lens, the tiny figurines would be held in front of the lens and utilized in telling the story of the Mexican-American war. With the right person manning the show, I suspect it could be quite a rousing tale. No mere silhouettes, several of the pieces employ small wires to manipulate the figures to replicate movement. 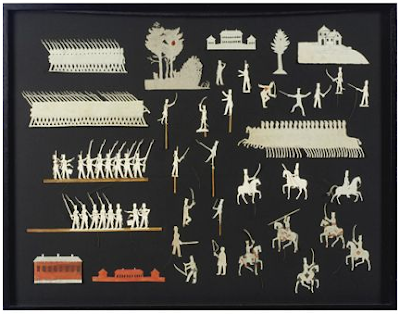 Though you have to register at Sotheby's, it proved worth it as I was able to use the picture viewer/zoomer feature to learn that at least some of the figures were cut from playing cards - a notable point that was missed in the description.